JAXA Astronaut Koichi Wakata has sent us a video message from the International Space Station (ISS). Dr. Wakata became the first ISS Commander as a Japanese on March 9, 2014. 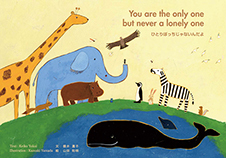 From the Japanese Experiment Module “Kibo (hope)”, he tells us about the spirit of helping each other on this beautiful earth, supporting “HEARTHEART” spirit of our activities. Dr. Wakata’s video message and will be sent to children all over the world, with animation movies we created.